the process of investing a substantial amount of capital in a bonafide enterprise in the United States and (3) be seeking to enter the United States solely to develop and/or direct investments of the enterprise. This is established by showing at least 50% ownership of the Enterprise or possession of operational control to a managerial position or other corporate device. Showing that the investment was substantial enough in total cost that it warrants establishing a new Enterprise or purchasing and established Enterprise. Showing that the amount of capital was substantial by means of being sufficient to assure that the treaty investors financial commitment is enough to make the Enterprise successful. Showing that the amount of capital invested is large enough that there is a strong likelihood that the Visa applicant will successfully develop and direct the company to success. invest in is bona fide. This means that the company or Enterprise is real, active and operating a commercial or entrepreneurial undertaking which produces services or goods for a profit. In other words the company written about in the business plan needs to be shown in a light that makes the government understand that it is not a fluke or just a sham in order to get a Visa. The company needs to have real operations or show that it will have real operations in the future. 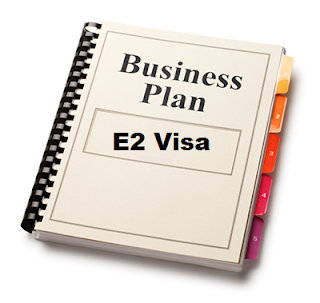 An E-2 Visa business plan should also showcase the qualifications of the Visa applicant(s) and how they are necessary for the operation of the business. This can be proved buy a specific skill set or job title or by proven expertise of the person's position in the company. The more detailed and extrinsic the business plan is written; the better the chances of an approval for an E-2 Visa. writer. Contact today at 203-685-0346 (leave a message or text to schedule a time). Email Nick.